Staples' Marco Latella pitches during the Wreckers' FCIAC championship baseball game against Wilton at Harbor Yard in Bridgeport, Conn., on Friday, May 29, 2015. Wilton won, 1-0, in the eighth. It was the most important game of the season to date for the Staples baseball team, a culmination of an outstanding regular season and run to the FCIAC final. And in the game they needed the most, the No. 2 Wreckers called upon a pitcher who missed most of the season with mono and hadn't made an appearance of any kind since April 14. Wreckers senior Marco Latella delivered a championship-caliber effort, but he and his team succumbed to a 1-0, eight inning loss to Wilton in the FCIAC title game at Harbor Yard. Latella threw a complete game and scattered seven hits as the Wreckers fell one game short of the Promised Land. In his first start of the season, Latella traded scoreless frames with Wilton's JT Morin -- who struck out 12 Wreckers and was named the game's MVP -- until the decisive eighth inning. Still cruising with two outs, Latella yielded a bloop single and stolen base to James Meany before Jackson Ward knocked him in for the game's only run. "(Latella is) a bulldog," Staples coach Jack McFarland said. "I called him (while he was sick) and asked him if he was coming back, and he said `coach since I was a freshman I've dreamed about coming to Harbor Yard,' and he lived it tonight." Three strikeouts by Morin later, the game was over. "I hate bloops," Latella said with a smile. "I felt good on the mound. (Catcher) Phil McGovern called for a fastball outside, but the last time I threw a pitch to (Meany) there he laced it up the middle. I wanted to get it in on his hands, and I did; I jammed him. I thought it was going to be a popup but it carried." Latella recovered from his illness with several games left in the regular season, but the tandem of Ben Casparius and Ryan Fitton ate up enough innings to keep Latella off the mound. Latella recorded the final out of the Wreckers' semifinal win over Trinity Catholic earlier Friday and then began preparation for a start to remember. "I had a hint yesterday (that I would start)," Latella said. "Coach asked me how my arm was and said I would be on the mound tomorrow. All of yesterday I just kept thinking is this going to happen? It's the FCIAC championship of course; I didn't know what to expect, I didn't know if my command was going to be good." Latella became the fourth pitcher for the Wreckers (18-5) this season to throw a complete game and allow one run or fewer, and all did it against FCIAC playoff teams. The depth of Staples' pitching was tested often this year, and it passed every time. "We have some tough pitchers, some great players," McFarland said. "We have good some sophomores, juniors and seniors." Latella's defense also played the part in the gem, including a diving catch by Zack Azadian that robbed a Wilton batter of an extra-base hit. "Plays like that really drive our team," Latella said. Fitton fired six and two thirds innings of two-run ball in the 8-2 win over Trinity. Forced to play a doubleheader to attempt to win the title, Staples dug in against its fresher opponents. "They played hard, they're great kids," McFarland said of his team. "This is a special team; they were asked to do a lot to do today that maybe the other team was asked to do as much." 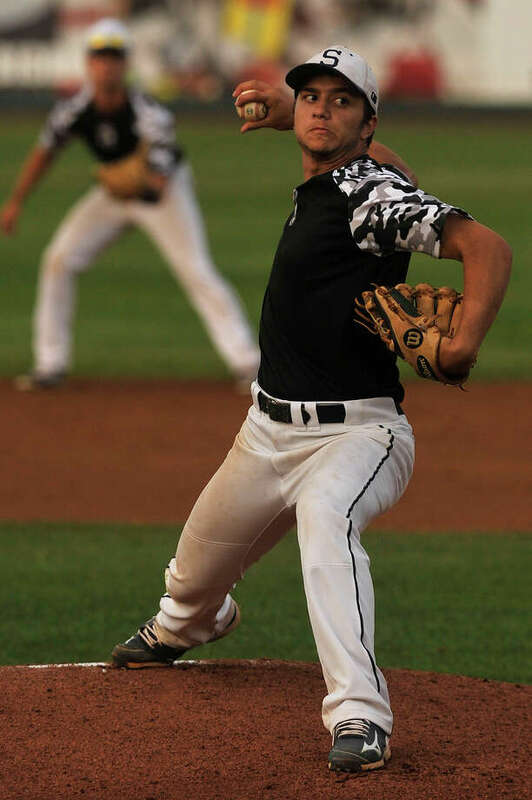 Latella moved to Westport from Norwalk in seventh grade and returned to Norwalk as a senior, but was allowed to finish his academic and baseball career with the crew he spent the last several years with in the dugout as part of a grandfather rule. He will attend the University of Richmond and hopes to walk on to the baseball team. Staples finished the FCIAC playoffs allowing three runs in 22 innings and will reload for the Class LL tournament starting Monday at home against Hamden. It was a dream come true for Latella, even if the outcome wasn't. A masterful performance on the FCIAC's biggest stage.